Katya is still bound and gagged in the caravan. She is slumped over the table; barely listening as Rob tells her the moment has arrived. As he speaks of his plans for the day Katya sees the gun in his bag. Robert tells Katya he wishes he could take her with him before leaving and locking the caravan door. Katya looks defeated and scared. Susan tells Toadie the police weren't much help as the focus of their investigation is Roberts whereabouts and not Katyas. Susan wonders if she should call Zeke but Toadie says it will just worry him. He says they should leave to go the wedding but Susan reminds him that police don't want everyone there, as it's too dangerous. Toadie tells her maybe nothing will happen but at least it will make him feel better than sitting around and waiting. Steiger tells Susan and Toadie that they are not going to the wedding. He tells them this is a police operation and says he won't have it jeopardised by anybody. Susan asks for information on Katya and Steiger tells them her credit card was used in the area a few hours ago. It confirms their suspicions that Robert is in the area with Katya. Steigers phone rings and he tells whomever he is talking to to put the ambulances on stand by. 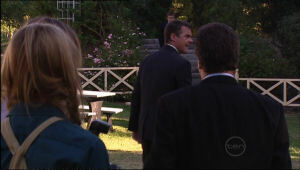 As his back is turned Elle and Izzy run through the background to meet Paul and Gail. 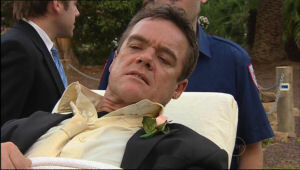 Paul is alarmed to see Elle and Izzy but both insist they will be at the wedding. Gail tells Elle it's too dangerous but she insists if Paul and Gail are putting themselves on the line then so is she. When Paul puts his foot down Elle asks about Izzy's involvement much to Izzy's annoyance. Paul says Izzy was about to leave and Steiger comes in and says they should both leave. Elle tells him the wedding will look like a fake if she isn't there as Paul and Gails daughter. Steiger sees her point and says she can stay. Izzy however has to leave, as Robert would not believe she would be at the wedding. But Izzy's insistent so Steiger comes up with a disguise for her…..
Boyd arrives to see Max. He had to fight his way through the cops who have the complex on lock down. Boyd confronts Max about the rental application. Max tries to explain but Boyd doesn't understand how he could have let Janae's real age just slip out. Boyd says Max is only there for him on his terms and thinks he wrecked the application because he didn't approve. Max tells Boyd he was trying to help and suggests he move back home. Boyd says that wouldn't work out and goes to leave. However with Rob on the loose Max won't let him out – looks like some Father/Son time is about to take place whether Boyd likes it or not. Steiger had a plan and Izzy is not impressed. Bang goes the slinky dress and in comes gardening overalls, complete with lumberjack shirt and hat. Paul is suitably shocked and wonders why Izzy is so keen to see him get married. She snatches the written vows from his hands and starts reading them. Paul takes them back and tells her the wedding just has to be material enough to convince Robert it's for real. Elle is helping Gail with her dress and Gail is obviously nervous. Elle assures her it's ok as all brides get nervous before their wedding. Gail reminds her the wedding is a fake but Elle asks if she's sure, after all she's read Gail's wedding vows and they seemed to be from the heart. Gail tells her the vows are from the book of ‘Overworked Wedding Cliches' and says they are for the benefit of Robert. Elle says in that case why write special ones. Gail pauses before saying that's what Robert would expect. Steiger tells the girls the celebrant is ready, it's time to go. Gail and Elle look scared as they make their way to the wedding. ELLE: My Mum and Dad are getting remarried. Ok getting fake remarried. I can't pretend that doesn't mean anything. Max and Boyd sit at opposite ends of the room. Boyd says the reason he and Janae didn't tell him about the house was because they knew he'd sabotage it. Max pleads innocence but Boyd is not buying it. Janae knocks at the door and tells Max to let her in. She says she knew Boyd would be here picking a fight. Max doesn't understand how Janae got here with the police cordon in operation. She explains that the police have no one guarding the delivery bay. Max says that's great – that's how Robert will probably get in. He reprimands Boyd and Janae for walking around like they are at a tea party when there is a murder on the loose. Steph runs in shouting that the police have no one guarding the delivery bay! Cue laughter from Boyd and Janae. Genius. Susan and Toadie are walking away from the wedding but Toadie is still on a mission. If Robert is around then he will find him. Susan says Steiger was serious when he said he's arrest him but Toadies not bothered. he wants to find Katya. Susan thinks he is off on false hope but Toadie says he told Katya he'd protect her and that he will. He says there must be something around here somewhere like the big caravan parked in front of them! As Katya hears their voices she makes a much noise as she can but it's not enough. Susan convinces Toadie he's jumping to conclusions and they walk away. Max is in the office clearly avoiding Boyd. Steph comes in and comments on how cleaning the office has suddenly become a priority. Meanwhile in the bar Janae tells Boyd to stop being so stubborn. Max wants Steph to go and talk to Boyd as she was there when he let Janae's age out of the bag but she won't do it. She says Max has to talk to him himself. Janae tells Boyd if they want Max to treat them like adults then they have to act in such a manner. Boyd goes to the office and tells Max he thought this might be a good time for a chat. Paul and Gail are at the altar holding their vows as Bridesmaid Elle and Gardener Izzy watch on. The celebrant asks Gail to share her vows. Gail opens her piece of paper, looks at Paul and begins. GAIL: Few people have the chance even once in their lives to find the happiness you and I had together, but we made mistakes and we let that happiness slip away. To have the chance to find it again I feel blessed. I'll never let you go, I promise. 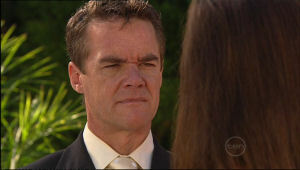 Paul looks at Gail transfixed as the celebrant asks him to share his vows. He opens his piece of paper and starts to recite his rehearsed vows, Izzy stands by mouthing the words with him. 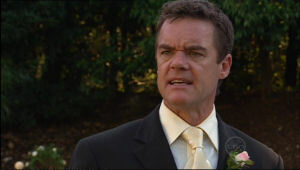 As Paul talks about his love for Gail he stops, looks at her and folds away his vows. He has news ones and these ones are from the heart. PAUL: Gail, I felt blessed the first time we were together and this time it's simply a miracle. Nothing in the world is going to let me risk losing you again. This time it's forever. Paul smiles at Gail and she smiles back, holding back the tears. Izzy looks on realising this wasn't part of the plan. Steph and Janae speculate on what Max and Boyd are talking about in the office. Janae thinks they are sulking but Steph says it doesn't matter; whatever they are doing they are doing it together. But Janae's worried and storms into the office. She tells Boyd he is lucky to have a Dad around who cares for him She then tells Max he should respect Boyd and his choices. She says that's all she has to say and walks out. MAX: She's kind of hard to dislike isn't she? Susan and Toadie are driving around looking for Katya but Susan thinks it's useless. Toadie stops the car…….the window…..the caravan window……he remembers it had Katyas gold shrug (mini cardigan for the male subscribers) hung near the curtains. He turns the car around and heads off to rescue his princess. Katya is still pretty out of it when Susan and Toadie arrive. Susan tries to open the door but she can't, Toadie gets his tool kit out of the boot. Susan sees the shrug hanging in the window and takes a sigh of relief. SuperToad forces the door open and finds Katya. As he unties her Susan calls for an ambulance. Totally gorgeous music used in this scene. She pronounces them husband and wife and tells them they may kiss. Paul tenderly kisses Gail and she kisses him back. Elle looks at her parents and is clearly taken back by their kiss. She tells an unhappy Izzy that she never knew her Dad was such a good actor. Gail breaks away from the kiss to sign the marriage certificate. Paul, still clearly in the moment follows her. Elle joins her Mum and tells her that was beautiful. Gail asks if it was convincing and Elle says it was, very. Steiger joins them and says he thinks they are playing to an empty audience. Paul says Robert will be here but Gail isn't so sure. Izzy thinks they should drop the whole charade but Paul insists on having photographs. Gail and Elle have their photos taken and Elle says that Paul was very romantic when he said his vows. Gail smiles and says Paul can be convincing when he wants to be. Elle wonders why he wanted to be convincing as Rob couldn't hear him, she thinks Paul was trying to convince Gail. Izzy arrives and tells Paul to stop the charade but he tells her to go away. Paul joins Gail and Elle and tells them Katya has been found. Steiger said it confirms the possibility that Robert is in the area. They agree to continue with the photos but as Elle and Paul head off Gail stays behind. Paul holds out his hand and tells her she is safe with him. She takes his hand and they walk to have their photo taken with Elle. Max tells Boyd he offered to go guarantor on the loan. Boyd is shocked. Max tells him he just wants what's best for him and says he has realised Boyd and Janae know what's best for them. He says they have all made mistakes and they both apologise. Boyd says he needs Max to have more faith in him. Max agrees. As they emerge from the office Steph and Janae are having a ‘peace meal'. They allow the boys to join them when they reveal they have made peace. Steph says they haven't welcomed Janae to the family yet and so they all toast to ‘Janae Hoyland'. Awww. Paul, Gail and Elle are still posing for photos. Steiger arrives and says the show's over; they've tried their best. Paul is reluctant to give in and walks away shouting after Robert. Gail and Elle are horrified as Paul tells Robert to show himself after all it's him he wants. PAUL: Your Mother and I have just got remarried. Well aren't you going to congratulate us? Aren't you happy for us? Paul taunts Robert saying he never fit in to the family and that he was the one he never cared about. Paul plays up to Roberts past words and says he's right, he never really loved him. As he turns around Robert is standing on the hill, behind the trees with his gun pointed at Paul. He shoots and Paul falls to the ground. 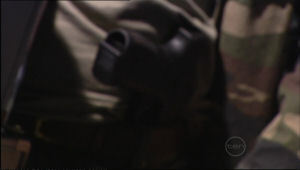 Rob lays his gun down as the police surround him. During the break Paul has been put on a stretcher and Steiger says he's just winded, the bulletproof vest saved him. 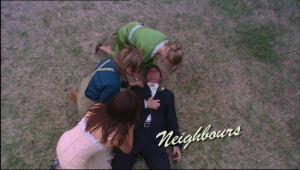 As Elle and Izzy follow Paul to the ambulance Gail lingers behind torn between Paul and her son. Rob is led to the police car and tells Gail that whatever Paul promised her was a lie – he would have destroyed their lives all over again. Paul sits up and Robert is horrified to find out he is still alive. Paul calls for Gail and Robert begs her not to go saying Paul will ruin her life all over again. Gail sadly shakes her head and walks towards Paul. ROB: Don't you relax for just a second. This is not the end.